It has been a habit for many of you read my posts on every 9:15 A.M. This has finally come to the end. Today as last page for 2008, let me wrap-up my progress for this year. The blog started in 12th May, and I slowly progress and look for my direction. Still remember my interview with NST bloggers' say on mid of November, I were looking for monthly achievement of 10,000 page view, managed to hit that in a month later. 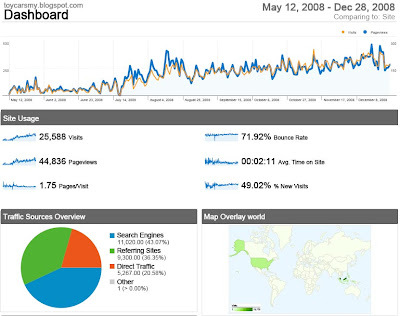 Toycarmy, a name came from no where has now viewed by 25,588 visitors from 118 countries. 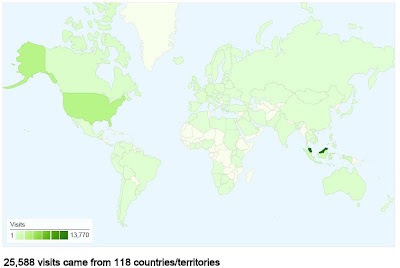 Of course we have Malaysia visitors interested the contents most, follow by U.S, Singapore, Indonesia, Philippines and UK. This means the key words positioning in the Google search results, it were my sweats and bloods, and it take time to sit in the #1 position. Results were mostly related Hot Wheels and Tomica from the collectors. 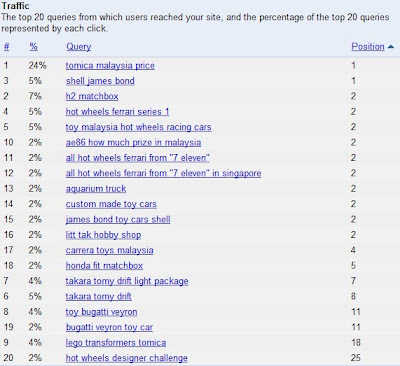 Surprise many people looking for Tomica Malaysia price? Any ideas? As for now, still working on this to cover more key words that related to the hobby. It did flash my mine to stop blogging, when I realize it took up much of my time on doing this. But after discussed with my wife, I decided to give it a try after settle down with my daughter. Thanks for the understanding. It will be a transition period for me to work around on this, I hope it will be a better toycarsmy and more informative that you looking for. I can't answer by now how long it will take, I still have some pre-wrote posts in the schedule, enjoy it first. Bye for now, see you next year. Thanks JD, same to you too. Happy new year! Hope for a bountiful and great year ahead! I think ppl want to know where to get the cheapest possible Tomica since after the price increase any reduction in price by retailers is highly welcomed. Oh, any possibility Litt Tak will reduce price? I know the Yen is a little on the high side now, but the ones already in M'sia b4 the price hike can do a little discount. Also will Hot Wheels increase price? coz in Parkson KLCC the HWs there already cost RM 6.50 but still the cars on sale there are OLD and LOUSY MODELS.